The apartment is situated in the sought after Duloch residential area of Dunfermline only 8 miles from Edinburgh. Dunfermline is connected by rail, an excellent road network and bus service to the Capital City. The area is mostly comprised of large detached houses with a small number of spacious apartments. Located at ground level the apartment is accessed from the private parking area via a short pathway through the manicured lawned grounds which belong to the apartments. The apartment opens in to a spacious hallway with good storage cupboard and hard wood flooring. A bright and airy lounge, with two large picture windows, one south facing, provides a sunny aspect to relax and enjoy a good book. The room is well furnished with a 3 and a 2 seater settee, side tables with lamps and occasional furniture with storage. The TV is connected to Freeview. There is also WIFI. Views are to the landscaped gardens which surround this lovely property. The modern kitchen with Siemens integrated appliances is very well fitted and stocked with an excellent range of cooking equipment. This spacious kitchen also offers a lovely dining area with glass table and four chairs. There is concealed lighting under the kitchen units should you wish to use these while dining. Both bedrooms are south facing with large fitted wardrobes and bedside tables with lamps. Both are very spacious and well decorated, with comfortable John Lewis mattresses and M & S bedding. The master bedroom has an en suite shower room with large shower unit, toilet and vanity unit. The 2nd bedroom is spacious again with a large fitted wardrobe, bedside tables with lamps and has exclusive use of a second large bathroom with bath, toilet and vanity unit. Both bathrooms have heated chrome towel rails. The property is maintained to a very high standard throughout. Dunfermline is situated just off the Forth Road bridge and offers a wealth of excellent restaurants, bars and cafes or try the coastal fish restaurants for the freshest of Scottish produce. Many hours can be spent wandering around the quaint old town of Dunfermline or in the beautiful ruins of the famous Dunfermline Abbey and Palace steeped in ancient history. Founded by Queen Margaret in the 11th century, it is now known for being the resting place of King Robert the Bruce and parts are still used for weddings and other civic functions. For golf lovers Dunfermline could not be better placed with a choice of 4 local courses and a further 41 golf courses including St Andrews 40 min (the home of golf). Aberdour 15 min. Burntisland 20 min. Balwearie (Kirkcaldy) 20 min Leven 30 min. Saline 30 min. Lundin Links 35 min. Kinghorn 25 min. Glenrothes 20 min. Cupar 25 min. Crail 40 min. Ladybank 35 min to name but a few! The town offers excellent rail and road links to Edinburgh (Festival and Fringe), Perth, Glasgow (City of Culture), The Lochs, The Trossachs and the Highlands. Whisky Distilleries and tartan shops/mills abound and there are many local festivals offering an insight to Scotland's traditions and culture including the Highland Games at Blair Athol. “T In the Park” is a popular music festival for the young held annually at Strathallan Castle in Perthshire and of course there are plenty of rugby matches at Murrayfield in Edinburgh for those interested in sport. Other Activities include theatre, concerts, Edinburgh festival and Fringe, Knockhill racing circuit. There are excellent transport links. The nearest road link to all routes is 5 min from the apartment. Edinburgh Airport is 15 min. The mainline train station offers fast transport to Edinburgh, Perth, the Trossachs, Highlands & East Coastal Route. The town centre is a conservation area boasting many historical buildings and is home to an excellent selection of trendy bars, restaurants, banks, shops and supermarkets. The local coastal villages offer some of the best fish and seafood in Scotland and have remained unchanged for centuries. The Fife Coastal Path is a very famous route which runs from the Firth of Forth with its rail and suspension bridges up to the Firth of Tay. On its journey it takes you along the East coast of Scotland through villages and towns such as Kinghorn, Burntisland, Elie, Anstruther and Crail. The area boasts some beautiful beaches and famous harbours with the white washed fishing villages of the East Neuk of Fife dotted along the coast line. We have just opened a tour company offering tours of Scotland and private airport/social event transfers. Have a look online for us maybe we can be of service to you. I was born and grew up in Edinburgh but I have travelled and lived abroad. I speak English and Spanish and just about manage to communicate in French and Italian, if the person I am speaking to is generous with their time and patience. I have a lot more travelling to do and I love meeting people from other countries/cultures. I love my country and it gives me great pleasure to provide a modern, clean and well kept property to visitors. The apartment is ideally based being opposite a beautiful vast area of natural parkland yet, with excellent transport links and shops/restaurants only a few minutes away. It has been my pleasure to welcome visitors to the apartment for 11 years now and my aim was always to give them a wonderful base from which they can enjoy and explore our magnificent country. The apartment is uniquely situation in an executive residential area, but only metres from the gates of a vast parkland with a lake of swans and ducks. It is a modern, warm and well insulated property set in private grounds and close to shops, bars and restaurants. For me it was instant love when I saw the place. Master bedroom has a well fitted en suite bathroom and bedroom two has exclusive use of the spacious bathroom with bath. Both bathrooms have fitted storage and mirrors with the en suite having a shaver point which also recharges electric toothbrushes. Dunfermline sits in the rolling hills and fields of Fife, surrounded by beautiful coastal and inland towns and villages. Dunfermline the ancient capital of Scotland and burial place of King Robert the Bruce in Dunfermline Abbey plus many more ancient Kings and Queens of Scotland. The kitchen is very well equipped with cooking utensils, dishes, serving dishes, pots and pans. The kitchen is well fitted with wall and floor units and integrated Siemens appliances including a washer/dryer. The kitchen is spacious and has a dining area with a table and seating for 4 people. The property is surrounded by communal gardens which you are welcome to use for sitting out. Excellent apartment. Would happily stay there again. House is warm and comfortable with a welcoming host. Plenty of space for four people. This is our first time using VRBO and it didn’t disappoint. Great location for day trips. The furnishings were gorgeous and felt very homey. Definitely would stay there again. Thank you so much for this lovely review. We try hard to make the house homely and it looks like we succeeded, which is great news. You were lovely guests and we would be delighted to welcome you back anytime. Take care. Absolutely loved this apartment ! As soon as we walked in we fell in love with it. Beautifully furnished . It had everything we needed . Lovely and quiet and handy for loads of places. Would definitely book again ! Superb apartment, a very good location, very quiet neighbourhood, 100% recommended. 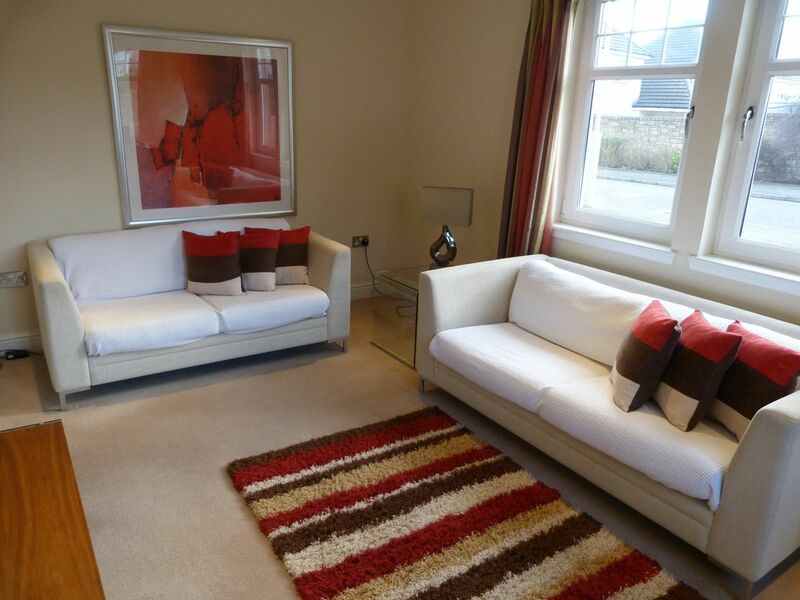 If you want to visit Edinburgh and surroundings, this apartment is ideal. It is also close to many other places of interest. The apartment is very well equipped, spacious and pleasant. The owners are very friendly and attentive. As I said, apartment highly recommended to rent. Great location for Edinburgh stay! This apartment is wonderful. The pictures don’t do it justice. We were met at the door by the owner, we were shown how appliances and TVs worked. Lots of room and so clean, loved having a washer in the apartment. It’s very close to a train stop (approximately 1.5 miles) for going into the city. Around the corner are some great restaurants and close to gas station and food store. I believe there is a walking trail across the street. The neighborhood is quiet. There isn’t a downside to this place. Also, the owners are very quick to respond to any questions prior to our arrival, just a pleasure from the start. You won’t be disappointed when choosing this apartment!! Julie thank you so much for this. We strive to offer our visitors a clean and comfortable stay and you have confirmed that we achieve that. It means so much to me. Glad you enjoyed the local facilities and the location of the apartment. Hope to see you again one day, you would be very welcome. Excellent Apartment, Very Relaxing in a very desirable area. We Really enjoyed our experience from the start, Greeted by Derek on arrival, We were made to feel very welcome. The Apartment was to very High standards throughout very clean. We were able to visit many places while using the apartment as a relaxing place to retire at the end of our travels. The area is very Quiet, well-kept people here are friendly as well. The apartment sits directly opposite the gates to Duloch Park, a vast expanse of well manicured grass backed by extensive woodland. The woods offer many sights such as deer, wild birds and swans/ducks on the small lake. It is a truly magical place to walk and take the kids. We are also very fond of a visit to Dunfermline Abbey and Palace, the resting place of King Robert the Bruce. The glen to the side is beautiful and also worth a wander. If you get hungry, try Kushies Indian in Canmore Street, or for take away, The Curry Pot our award winning local take away only 400 yards from the flat. Garvock House Hotel, the elegant 200 year old country hotel, provides excellent Scottish cuisine served in their beautiful restaurant with views over the lawn and of course, there is Incontri the Italian restaurant in Bruce Street. The nearest eatery to us is The Mill and Grill, a modern bar/restaurant only 5 minutes walk from the apartment, but we also have a traditional Scottish fish and chip shop and a Chinese take away. Local shops are the CoOp at 400 yards or Tesco at a 10 minute walk. Beside Tesco you will find a pharmacy, dry cleaner, hairdresser/beauty salon and various other food offerings. The high street of Dunfermline and the various retail parks offer a plethora of shopping options for all purses and of course, you can always get the local train to Edinburgh, Dundee, Perth, Glasgow or Aberdeen if you fancy some serious retail therapy. You will never run out of places to go or things to see in Dunermline.